Update, 4th Mar 2016: We were deeply saddened to learn of the sudden and unexpected passing of Trevor Stuart on the 2nd March 2016. A family man, and a friend to so many, he will be sorely missed by us all. The Stuart Brothers are world renowned for their masterful performances of Appalachian fiddle and banjo duets. 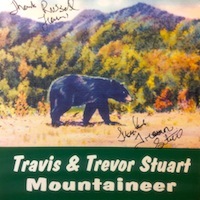 Trevor and Travis were born and raised in Bethel, in the shadow of Cold Mountain, an area of magical beauty where the Blue Ridge and Great Smoky Mountains meet, and which was once the ancient Cherokee settlement of Sonoma. The young brothers were steeped in a rich musical and cultural environment of Appalachian fiddle tunes, Baptist spirituals, banjo pickers, all night square dance shindigs and poetic tale weavers. They have deep family musical roots: their great grandfather was the legendary fiddler Rev Henry King; their great uncle the banjoist and singer Austin Stamey. The brothers learned some of the oldest regional fiddle and banjo styles from masters such as the Smathers Family, Byard Ray, Oscar ‘Red’ Wilson, Gordon Freeman, and the Sutton family. They have toured extensively throughout the US and northern Europe, teaching and performing at major festivals and music camps. Both Travis and Trevor are multi-instrumentalists. Together and separately they have performed on some of the world’s most prestigious stages: London’s Albert Hall, Dublin’s Vicar Street, Levon Helm’s Midnight Ramble, and New York City’s Beacon Theater. They have performed together for thirty years, and also toured and recorded with step dancer Ira Bernstein, songwriter Martha Scanlan, Dirk Powell Band, Rayna Gellert, Foghorn Stringband, Riley Baugus, and many more.